Gingivitis is a word that many people have heard, but not a lot of people know what it is or why you don’t want it in your mouth. Why? 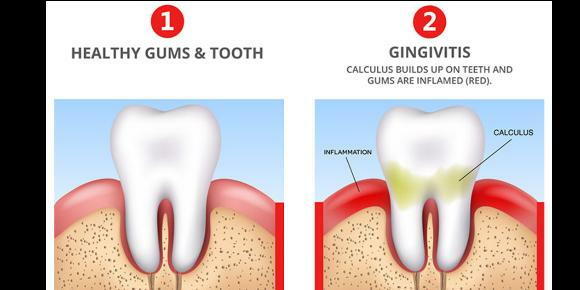 Because gingivitis is a form of periodontal disease that produces inflammation and infection that destroys the tissues that support the teeth, including the gums, the periodontal ligaments, and the tooth sockets.Gingivitis is due to the long-term effects of plaque deposits on your teeth. Plaque is a sticky material made of bacteria, mucus, and food debris that develops on the exposed parts of the teeth. It is a major cause of tooth decay. If you do not remove plaque, it turns into a hard deposit called tartar (or calculus) that becomes trapped at the base of the tooth. Plaque and tartar irritate and inflame the gums. Bacteria and the toxins they produce cause the gums to become infected, swollen, and tender. Misaligned teeth, rough edges of fillings, and ill-fitting or unclean mouth appliances (such as braces, dentures, bridges, and crowns). Many people have some amount of gingivitis. It usually develops during puberty or early adulthood due to hormonal changes. It may persist or occur frequently, depending on the health of your teeth and gums. The main goal to treat gingivitis is to reduce inflammation. The best way to do this is for your dentist or dental hygienist to clean your teeth twice per year or more frequently for severe cases of gum disease. They may use different tools to loosen and remove deposits from the teeth. Careful oral hygiene is necessary after professional tooth cleaning. Any other related illnesses or conditions should be treated. Good oral hygiene is the best way to prevent gingivitis. You should brush your teeth at least twice a day and floss at least once a day. Special devices may be recommended if you are prone to plaque deposits. They include special toothpicks, toothbrushes, water irrigation, or other devices. You still must brush and floss your teeth regularly. Antiplaque or anti-tartar toothpastes or mouth rinses may also be recommended.